� 2011, American Society for Microbiology. All Rights Reserved. We have developed a Salmonella genoserotyping array (SGSA) which rapidly generates an antigenic formula consistent with the White-Kauffmann-Le Minor scheme, currently the gold standard for Salmonella serotyping. A set of 287 strains representative of 133 Salmonella serovars was assembled to validate the array and to test the array probes for accuracy, specificity, and reproducibility. Initially, 76 known serovars were utilized to validate the specificity and repeatability of the array probes and their expected probe patterns. The SGSA generated the correct serovar designations for 100% of the known subspecies I serovars tested in the validation panel and an antigenic formula consistent with that of the White-Kauffmann-Le Minor scheme for 97% of all known serovars tested. 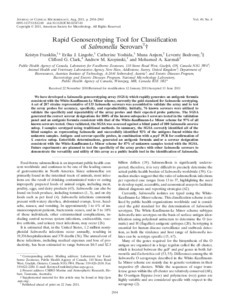 Once validated, the SGSA was assessed against a blind panel of 100 Salmonella enterica subsp. I samples serotyped using traditional methods. In summary, the SGSA correctly identified all of the blind samples as representing Salmonella and successfully identified 92% of the antigens found within the unknown samples. Antigen- and serovar-specific probes, in combination with a pepT PCR for confirmation of S. enterica subsp. Enteritidis determinations, generated an antigenic formula and/or a serovar designation consistent with the White-Kauffmann-Le Minor scheme for 87% of unknown samples tested with the SGSA. Future experiments are planned to test the specificity of the array probes with other Salmonella serovars to demonstrate the versatility and utility of this array as a public health tool in the identification of Salmonella.